SEPTEMBER 27th-OCTOBER 7th, 2018: 5th Annual Creek Week Cleanup - Seeking Creek Crews. Be a part of the largest cleanup in the state of Colorado! Creek Week volunteers clean up litter along the creeks, trails, parks and open spaces from Palmer Lake to Pueblo during this 9-day event happening 9/27-10/7 this year. Individuals and groups (families, clubs, schools, churches, neighborhoods, etc.) are invited to form a Creek Crew. Get outdoors, get active, and create some good for your community and those living downstream! Last year, over the course of nine days, 2,592 citizens formed 81 groups and collected nearly three THOUSAND bags of litter and debris, weighing in at over 30 TONS. OCTOBER 6TH, 2018: The CWC POND Committee has organized a South Platte River Clean Up. They will meet at 9am to pick up trash along the river banks and trail system in Littleton. The group will walk to Breckenridge Brewery where volunteers can grab a beer, have lunch, and network around the noon hour. The event is open to all, so please feel free to bring your friends. For more information and to register, please see the Colorado Water Congress website HERE. OCTOBER 6TH, 2018: The Purgatoire Watershed is putting on the Purgatoire River Cleanup. Come learn about your river, walk the River Walk trail, and help clean up your river! All ages welcome! Meet at Noah’s Ark Parking Lot. Registration & Snacks & Goodies & Get Cleanup Gear: 9:30 am. Educational Speakers Begin: 10 am. River Clean-Up: 10:30-12:30. Free Lunch for All Volunteers: 12:30 pm. Safety First! Bring gloves if you have ‘em – if not we’ll have a few extra pairs of gloves. We will only be picking up easily accessible trash along the trail. We will be avoiding any trash that is unsafe or in unsafe areas! For more details contact Julie Knudson, Purgatoire Watershed Partnership (PWP). 970-420-1915. purgatoirewatershedpartnership@gmail.com. OCTOBER 9th - 11th, 2018: 13th Annual Sustaining Colorado Watersheds Conference. The Color of Water: Exploring the Spectrum, Westin Riverfront Resort, Avon, CO. Don't miss the premier watershed conference in Colorado. Expanding cooperation and collaboration throughout Colorado in natural resource conservation, protection and enhancement by informing participants about new issues and innovative projects and through invaluable networking. For information and registration go to SCW Conference 2018. OCTOBER 11th, 2018: Bits & Brews for Biodiversity, presented by Rocky Mountain Wild. Help our wildlife biologists identify animals from our camera traps. Use technology to “fly” over Wolf Creek pass to see how development will destroy the wildlife movement corridor. Visit Gunnison sage-grouse habitat threatened by oil and gas development. Gear up to become a citizen scientist and get your photo taken by a wildlife camera. And more! Join our staff for a fun-filled evening of activities, all while watching the sunset over Denver and the Rocky Mountains from the 32nd floor of a downtown skyscraper. Dine on wildlife-friendly vegetarian and vegan tapas. Enjoy a complimentary drink in your commemorative Keep the Eeep! pint glass. And don’t forget to bid on items in “The Most Awesome Environmental Silent Auction in the Front Range.” All proceeds go toward our work to protect biodiversity in the Rockies. For full event details, click HERE. OCTOBER 24th-25th, 2018: 29th Annual South Platte Forum at the Embassy Suites in Loveland, CO. The conference will feature an exciting lineup of speakers and topics, and a great opportunity to network. Find the list of speakers and their bios HERE, and all general and pertinent information and links HERE. OCTOBER 30th, 2018: 10th Annual Water Conservation Symposium at the Denver Botanic Gardens. Join them for the 10th Annual Colorado WaterWise Water Conservation Symposium in Denver, Colorado! They have a great program that will appeal to many audiences. Register now as space is limited. To register, visit their website HERE. NOVEMBER 7th, 2018: Colorado Healthy Rivers Fund Hoorah! Join the Colorado Watershed Assembly for this end of year celebration and fundraiser for the Colorado Healthy Rivers Fund (CHRF) from 6:00 pm - 8:00 pm at the Skylark Lounge, 140 S. Broadway, Denver, CO. The CHRF grants money to on-the-ground projects that contribute to cleaner water, healthier wildlife habitat, improved recreation and vibrant local economies throughout our state. Tickets are on sale at Colorado Healthy Rivers Fund. NOVEMBER 7th-8th, 2018: 8th Annual Upper Colorado River Basin Water Forum will be held at CMU University Center in Grand Junction, CO. For more, click HERE. CALL FOR ABSTRACTS will expire June 30th. Click HERE for details for abstracts. FEBRUARY 4th - 6th, 2019: ESRI Water Conference: Discover How GIS Helps Us Better Manage Our Most Precious Resource. Some of the topics that you can look forward to learning more about include; Big Data and Analytics, Watershed and Floodplain Delineation, Asset Management, Field Workflows and Mobile Applications. Post-Conference training will cover using ArcGIS for water utility workflows. Learn new best practices and solutions to strengthen your operations with the power of the ArcGIS platform. REGISTER HERE. 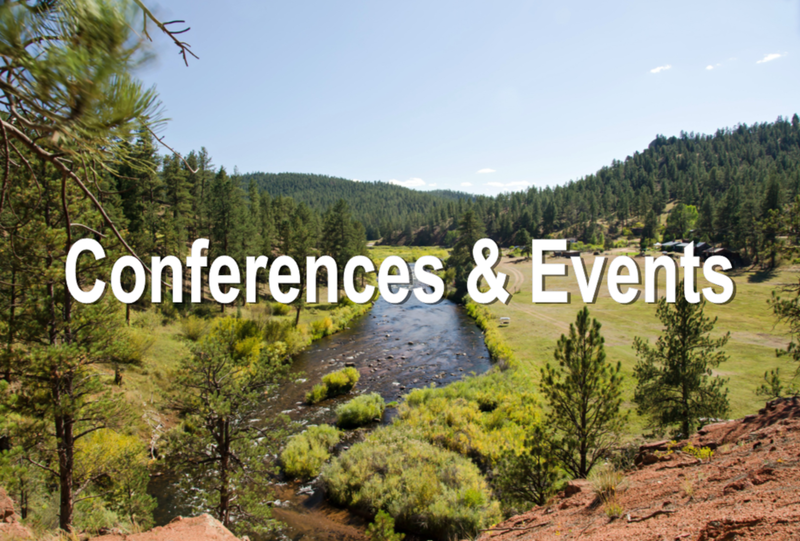 FEBRUARY 11th – 14th, 2019: Colorado Rural Water Association Annual Conference and Exhibition. SAVE THE DATE! This event will be held at the Crowne Plaza DIA Convention Center, 1550 East 40th Avenue, Denver, CO. For more information click HERE.